Music video by Michael Jackson performing One More Chance (Michael Jackson's Vision). 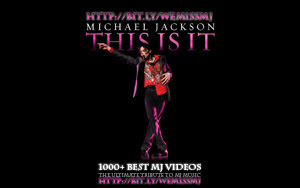 (C) 2010 MJJ Productions, Inc.
Disclaimer: This website served as a tribute to Michael Jackson. This website functioning as a mere index and database of content found publicly on the internet, we do not host any media content (avi, flv, mp4, mpeg, divx, mp3...) on our servers. Unless otherwise stated, all media content are uploaded by and hosted on third-party websites, so called video sharing websites and file sharing websites, such as YouTube, etc...In case of any issues regarding the videos, please directly contact the responsible parties.